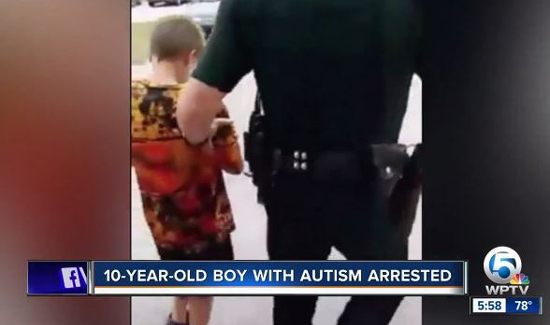 A mother is fuming after her 10-year-old son with autism was handcuffed, placed into a police car and taken from an Okeechobee County school. Mother Luanne Haygood captured the entire video and posted it to Facebook. “I was extremely angry. That I felt like this was a power play. I felt like this was a this is what you get. You can’t do anything about it. We’re going to arrest your son if he can’t abide by the rules,” she said. The sheriff’s office says John Haygood was arrested for felony battery on a school board authority. His mother said this stems from when he kicked a paraprofessional at Okeechobee Alternative Academy back in October. “He didn’t feel good with a paraprofessional. He told me that and I told him you got to go back to school. He said, ‘I don’t want to go back to school. I don’t like him. I don’t like him. He hurts me,’” she said. John’s mother does not deny her son’s troubled history in school, but says his autism is responsible for his behavior. In October, John was expelled from school and forced to complete work from home. But Wednesday, when he reported back to school for the first time in five months for state testing, things didn’t go as planned. “To go and have him arrested on school grounds in front of other students, in front of personnel, during school hours, they could’ve come to my house at any time to tell me what was going on,” she said. Why was this juvenile placed in handcuffs? We here in Georgia very seldom place juveniles in handcuffs unless we know the juvenile is violent or the juvenile is way larger then we the police officer is. We will take the juvenile to the police department and contact a parent to come in prior to any questioning and then we read the juvenile his rights and have both the parent and the juvenile long with the officer sign a rights understanding form then a waiver of his rights if he/she are going to speak to us about that crime. This is not what a police officer/deputy sheriff should have done. I can see no reason for the way this juvenile was treated. Unless we are not seeing the whole video. We in Georgia do not arrest juveniles we detain a juvenile on a juvenile complaint form. You can never rely on LE professionals to exercise good judgment. This was clearly over the top and indicative as to why LE needs to be out of our schools. The fact that school officials thought it necessary to file charges against an autistic 10 yr old and that someone in the judicial system actually validated an arrest warrant on such a ridiculous charge is asinine. The cops had plenty on opportunity to perform this outrageous action away from the public. Instead, their poor judgement has exacerbated relations with the community.